Specialization in Marketing: The objective of specialization in the field of marketing in MBA is to increase the knowledge and enhance the skills of those working in the field of marketing, advertising, public relations etc. The goal is to develop increased sophistication relative to marketing decisions, and prepare students to study at advanced levels. The course is designed to give students conceptual frameworks and tools to help firms meet demands of the marketplace in a profitable way. A wide range of marketing strategy topics and marketing are covered along with imparting the knowledge of the discipline’s foundations. Specialization in Finance: Today’s financial environment, the fundamental trade-off between risk and return, the time value of money, and valuing future cash flows are important for budding managers. Financial tools and techniques, which can be used to help firms maximize value by improving decisions relating to capital, are vital areas in finance which specialists in finance should know. The course develops the basic analytical skills and principles of corporate finance and applies them to real-world problems using case analyses. Students are trained to evaluate financing alternatives, to plan the company’s future performance, to evaluate investment projects and choose the optimum financial mix. A graduate with Bachelor or Master Degree from any discipline who has passed with minimum 50% marks in aggregate (45% in case of SC/ST candidates) from a recognized university. The candidates in their final year degree (Bachelors or Masters) are also eligible to apply. The admission of student will remain provisional until the other necessary certificates are submitted to the institute. The last date to submit all the certificates in original, shall be 25th August 2018. If the certificates are not submitted by the said date, the eligibility will not be granted and the admission would automatically be cancelled. Subject to the fulfillment of above conditions, the final admission is based solely on the merit at the All India entrance test (B-MAT) conducted by the Bharati Vidyapeeth Deemed University, Pune. The term aggregate marks used here shall mean the grand total marks obtained by the candidate, taken together for all the subjects, based on which the class declaration is made in that particular university from where the candidate has obtained the degree. The candidate should have completed minimum of 15 years of formal education (10+2+3 or 10+2+4 basis). The candidates who have pursued their graduation in any medium other than English will have to complete an orientation course in English provided by the institutes satisfactorily. The candidate who has done his graduation on part time or one time seating basis or on a two year basis are not eligible. The candidates in their final year degree (Bachelors or Masters) are also eligible to apply. The admission of student will remain provisional until the other necessary certificates are submitted to the institute. The last date to submit all the certificates in original, shall be 26th August 2018. If the certificates are not submitted by the said date, the eligibility will not be granted and the admission would automatically be cancelled. Application form obtained from BVIMR New Delhi free cost from admin department. The completed Application form along with D.D. of Rs.2006/- payable at Pune drawn on Bharati Sahkari Bank Ltd. Or any Scheduled bank in favour of the Registrar, Bharati Vidyapeeth University is to be submitted to the following address on or before 21st March 2018. The registrar, Bharati Vidyapeeth Bhawan, Lal Bahadur Shastri Marg, Pune-30. Online: Application form can also be filled and submitted online on our website along with online payment of the application fee of Rs.2006/-. The admission is based solely on the merit at the All India entrance test (B-MAT) and GD/PI conducted by the Bharati Vidyapeeth Deemed University, Pune. 1 Pune BVU Institute of Management and Entrepreneurship Development, Paud Road, Erandwane, Pune-411038. 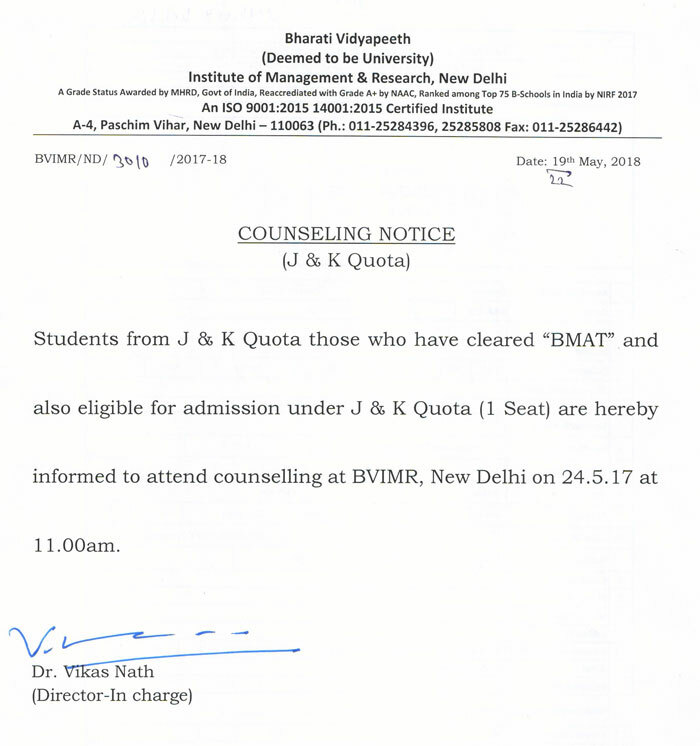 2 New Delhi Bharati Vidyapeeth University Institute of Management & Research, A-4, Paschim Vihar, (Attached to Paschim Vihar East Metro Station) New Delhi-110063. 3 Navi Mumbai BVDU, Institute of Management, Sector No. 8, CBD Belapur, Navi Mumbai-400614. 4 Karad Bharati Vidyapeeth University Yashwantrao Mohite Institute of Management Bharati Vidyapeeth Educational Campus, Venketesh Nagar, Koyana Vasahat, Malkapur, Karad. 8 Lucknow Annie Besant Inter College Gomati Nagar, Vinay Khand-1 (Near Malik Timber) Lucknow, Uttar Pradesh-226010. 9 Chandigarh Stepping stones Sr. sec School, Sector-37D, Chandigarh-160036. 10 Kolkata St. Xavier’s College, 30, Mother Teresa Sarani Road, Kolkata, West Bengal-700016. 11 Jaipur Vinayak Public Sr. Sec. School,Near Main Bus Stand & Opposite Kalwar Road, Facing Main Gate of Sushant City-1, Machwa, Kalwar Road, Jaipur, Rajasthan-303706. 12 Indore Shri. Atal Bihari Vajpayee Govt. Arts and Commerce College, AB Road, Bhawar Kuan, Navlakha, Indore-452001.